A security guard sits near a gate in Addis Ababa, Ethiopia, Oct. 10, 2016. It's been five months since Ethiopia declared a state of emergency in response to widespread protests and unrest, and there are no signs indicating when it might end. Despite the release of about 20,000 detainees, top opposition leaders remain in jail. 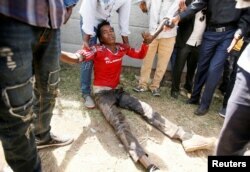 Most have been charged under the Ethiopia's anti-terrorism law, which is often used to stifle dissent and arrest journalists. 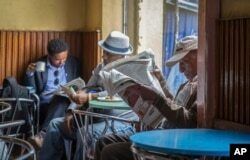 Ethiopian men read newspapers at a cafe in Addis Ababa, Ethiopia on Oct. 10, 2016. 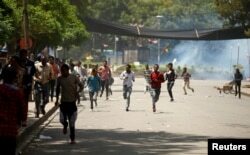 Ethiopia's government on Monday blamed Egypt for supporting outlawed rebels and forcing the declaration of the country's first state of emergency in a quarter-century as widespread anti-government protests continue. “As of now, the state of emergency has accomplished its goal," said Prime Minister Hailemariam Desalegn, speaking to reporters in January. People assist an injured protestor during Irrechaa, the thanks giving festival of the Oromo people in Bishoftu town of Oromia region, Ethiopia, October 2, 2016.